P.G. 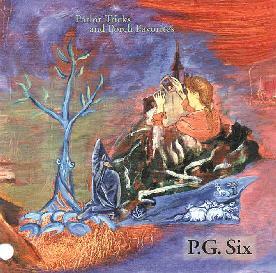 Six - "Parlor Tricks And Porch Favorites"
Pat Gubler is one of the members of the Tower Recordings collective. After four albums with that band, and involvement with its various offshoots (such as Matthew Valentine's MV Holoscanner), this is his first full-length solo release, created with assistance from percussionist/engineer Tim Barnes (also now a Tower member). The entire album is in the experimental acoustic realm, with both folk songs and freer sections. The only electric instruments are the occasional guitar and keyboard (Wurlitzer piano, Farfisa organ, Prophet analog synthesizer), all tastefully and sparsely applied, while various fringe/ethnic acoustic instruments such as Kemance, Ukelin, Shakuhachi and D'tzu are also employed. Included are guitar instrumentals inspired by forward-thinking instrumental folk artists such as guitarists John Fahey and Sandy Bull. In addition to electric and acoustic guitars, harps play a major role in the recording, often contributing to a shimmering sound spacier than what one might expect from instrumental folk. Titles like "The Divine Invasion" and "Unteleported Man" will also clue the astute reader that something not-entirely-earthly is in the air. And while songs such as "When I Was A Young Man" and "The Shepherd" are very much in the hippie/folk vein of the Incredible String Band, as the press release highlights Gubler's work backing Robin Williamson, the music completely avoids the annoying tweeness that too often follows similar influences. You'll have to look elsewhere for Hobbit Rock. Sublime moments include "Quiet Fan For SK", where a Fahey-esque extended improvised sparsely-acoustic introduction is joined by celestial Wurlitzer electric piano and exotic bowed instrument for a brief full-bodied coda, and "Go Your Way", originally written by Anne Briggs, which concludes with a tabla-driven section, suddenly adding momentum to a mostly staid-rhythmed number. While a subdued vibe permates throughout, unusual touches such as the aforementioned tabla coda, the martial folk-rock beat on the bridge in "When I Was A Young Man" and guitar distortion on its' finale, the backwards guitar on "The Divine Invasion", and the ringing synthesizer tones on "The Fallen Leaves That Jewel The Ground", all contribute to compelling sonics which signify that this album is far more than mood music for a mellow evening. Except for extreme drones from the likes of Tony Conrad and Lamonte Young, it's difficult to imagine acoustic music more spaced-out than this album. Contact via snail mail c/o Amish Records; PO Box 1841; New York, NY 10013.